The back is the ultimate piece of engineering. It is composed of bone, joints, discs, ligaments, muscles and nerves which all work together to support the body and enable movement. The bony architecture also supports and protects the spinal cord. The Spinal column is the structure that supports your body from your head to your pelvis. It consists of a series of blocks of bone, separated from each other by a “disc” (sometimes referred to as a shock absorber). The complex interaction between the blocks of bone and disc allow a specific amount of movement between every vertebra. There are seven vertebrae that make up the cervical spine, twelve in the thoracic region and five in the lumbar region. The remainder form the sacrum and coccyx. The vertebra form a bony tunnel called the spinal canal in which the spinal cord runs. The cord is a collection of nerves which links the brain and the body. It runs from the brain to the first or second lumbar vertebrae. Below this the nerves are in strands called cauda equina. The cord is protected by three membranes called meninges and is surrounded by cerebrospinal fluid. The outer membrane is called the dura, the space between the spinal canal and the dural sac is called the epidural space. The complex interaction between the spinal column, and the spinal cord is the key to understanding your symptoms. Understanding spinal symptoms can be quite complex. However, a simple pathophysiology (abnormalities) lesson can be very helpful. Abnormalities in your ability to use your hands, legs, bladder or bowels. The vertebrae are linked by an intervertebral disc at the front and by two facet joints at the back. The intervertebral discs formed of a tough outer part called the annulus, and a softer inner part called the nucleus pulposus. The nucleus pulposus is a gelatinous substance which helps articulate the vertebra and cushion the spine. The disc can efficiently absorb compressive and jarring forces but is more susceptible to twisting forces which can result in the outer layers weakening and occasionally tearing or stretching. As we get older the consistency of the nucleus changes. It can deteriorate and dehydrate -this is part of normal wear and tear and is also known as disc degeneration. The wear to the spinal discs in the vast majority of the population does not reach a level that produces pain and disability that requires treatment. The vertebras are linked by an intervertebral disc at the front and by two facet joints at the back. The facet joint is the joint between the vertebrae towards the back of the spine. The surfaces of the facet joints are cartilage lined and they are lubricated with synovial fluid. Like other joints in the body they can wear (degenerate). Degeneration of both the discs and facet joints are part of the normal ageing process. These changes are often widespread and cannot be reversed. Any wear on a joint can produce arthritis. Wear or degeneration may be the source of back or neck pain, but in many cases as the changes occur very slowly the process does not result in significant ongoing pain. The spinal nerve roots exit the spinal canal through foramina (holes) between the vertebra and facet joints. They are often compressed or irritated by surrounding tissues which can result in the patient experiencing leg pain, back pain or arm pain. This is known as sciatica when it affects the legs and radiculopathy in the arms. The ligaments help to hold the vertebra together. The main ligaments run the whole length of the spinal column anteriorly and posteriorly. Without regular movement or through normal ageing ligaments can become stiff which can reduce their function resulting in reduced spinal movement and pain. The spine is supported by many groups of muscles. There are smaller deeper muscles close to the vertebrae which help to control spinal posture and there are larger more superficial muscles surrounding the trunk which enable the major movements of the back. The vast majority of short lived episodes of acute back pain are due to muscle pain. Back pain is common and affects at least 14% of the population at any one time, almost 40% will have experienced it in the past month, and 60-80% of the population will be troubled by it at some point and often will experience an episode of pain of sufficient severity to prevent them from performing their normal work or social activities. Symptoms of back and neck pain will usually settle, or at least improve significantly, within seven to ten days. In over 80% of cases pain will resolve within four to six weeks. About half of those who suffer back pain may experience another episode within two years. Back pain resolves for the majority of patients it becomes chronic and disabling in less than 15% of these patients. Approximately 10% of people will seek medical attention for their pain. Back pain incidence over the last 40 years in the UK remains unchanged however, the incidence of disability caused by the back pain has increased and the level of intervention has also increased. People are encouraged to stay active and get on with their lives despite their discomfort. This will often require you to modify the way certain activities are performed. The majority of patients with acute spinal pain can be managed in the primary care setting. However a small number of patients have significant pathology in this group such as tumours, fractures, infections and cauda equina lesions that require prompt diagnosis and specialist management. Any management strategy for the care of large amounts of patients with spinal pain needs to identify this sub group quickly and effectively. The Red Flag system is widely used to identify these patients. This requires high quality triage and imaging resources to prevent individual patient disasters. Following appropriate triage and assessment the majority of patients can be managed with advice and analgesia, formal physiotherapy treatment is rarely required. Patients over age 50 with back pain for the first time in your life. Any symptoms of incontinence of faeces or an inability to pass urine should likewise seek emergency medical advice to exclude cauda equina syndrome. Severe back or neck pain after a fall or accident should always be assessed by GP or Accident and Emergency. If the episodes of acute pain settle but frequently recur and are interfering with your activities or work then further advice from a specialist may be sought to find a diagnosis and discuss treatment options. Acute back pain is normally a self limiting condition which can be caused by a minor injury or occur due to no obvious cause. The majority of acute back pain episodes settle within a few days but some can last up to 12 weeks. In the initial phase take simple, over the counter pain relief (if not contraindicated – always check with your pharmacist,) have a brief period of rest (1 -2 days) but then try and regain spinal movement by undertaking gentle spinal stretching exercises as the pain allows. The analgesia (pain relief) can help to enable you to perform spinal stretching exercises. Avoid activities that worsen your pain. Be particularly careful about lifting. If the acute back pain episode has not settled in the first 2-4 weeks or the pain is not helped by simple analgesia advice should by sort from your GP to assess the cause of the pain and exclude serious pathology. The GP may prescribe stronger analgesia and direct you to a suitable therapy service or they may refer you to a Spinal Specialist for further investigation and treatment. Chronic back pain is back pain which has been present for over 3 months duration. Patients with chronic back pain should always have been assessed by a GP who may refer them to a therapist. If the therapy initially tried is not improving their symptoms they may seek advice from another therapist or a different type of therapy. It is not recommended to continue therapy if it is worsening the symptoms or if symptoms have not improved after 4 weeks of treatment. If the level of symptoms, although chronic, are manageable to the patient then no further action may be required. However if the symptoms are preventing normal activities or work then the next stage would be to seek consultation with a Spinal Specialist Consultant. The Spinal Specialist will aim to make an accurate diagnosis of the source of your pain. This will enable you to discuss with the Consultant the treatment options and long term out look for your condition. Sciatica is a term that describes pain in the distribution of the sciatic nerve. The pain may extend from the buttock into the leg and radiate below the knee to the foot. Sciatica is pain down your leg caused by pressure on a nerve where it leaves your spine. This can happen if a disc in your spine becomes worn and develops a bulge (a 'slipped disc') (see figure 1). Pain usually results from a disc protrusion or rupture, where disc material reduces the capacity of the spinal canal and results in the compression of a lumbar nerve root. Disc bulges are a common finding on either a CT or MRI scan and may not always be the cause of your leg or back pain. In the majority of cases (70%), symptoms of sciatica will settle spontaneously within a six week period, and treatment is initially directed towards reducing pain to enable the patient to keep active both at work and at home. When sciatica due to a disc protrusion does resolve there is a 25 to 50% chance that symptoms will return in the first year. Even if this should occur there is still a 90% chance that symptoms will again resolve within twelve weeks. As a result of the natural history people with sciatica rarely require surgery. If your recovery is not quick or you show any signs of cauda equina, where the nerves to the bladder and bowel are affected then operative intervention may be appropriate. Spinal stenosis is where the space in the centre of the spine (spinal canal) narrows. The spinal canal contains the nerves that leave the lower end of the spinal cord (see figure1). A combination of arthritis in the spine, thickening of the ligaments, and bulging of the discs can cause this to happen. The nerves can get trapped in the spinal canal or where they leave the spine, causing weakness or pain in your legs. Surgery can relieve the pain and or weakness in your legs. Sometimes, pieces of the disc can push backward into the spinal canal and press on the nerves or spinal cord. Inflammation from the disc can sometimes irritate the nerves or spinal cord. Other times calcium deposits can build up on the back of the vertebra and push on the nerves or spinal cord. One of these calcium deposits is called a "spur", the medical name is "osteophyte", which means a bony projection. These spurs can pinch the nerves to the arms or can press on the spinal cord itself, causing pain, weakness, or numbness. Sometimes surgery is necessary to remove them. If You Have a Herniated Cervical Disc causing neck and arm pain, and if you have not improved from a good program of conservative care, then you might consider having surgery. 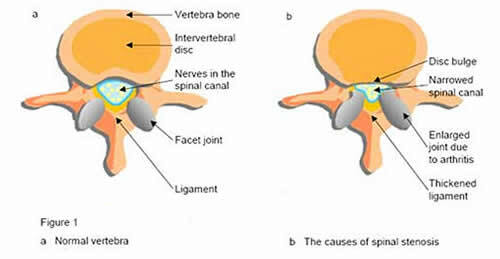 A herniated disc develops when a disc between the vertebrae breaks down. The back part of the disc becomes weak and the disc pushes backward against the nerves or even against the spinal cord, it can cause symptoms of myelopathy or pressure on the spinal cord, if this is progressive then surgery is more urgent. Scoliosis is an abnormal sideways (lateral) curvature of the spine. The spinal column (backbone) of the patient with this condition curves and twists, so rotating the ribcage. X-rays of individuals with scoliosis show an ‘S’ or a ‘C’ shaped curve rather than a straight line. Scoliosis can be disfiguring and often presents with a hump. Scoliosis affects approximately 2% of the population to some degree but serious noticeable curves are much less common. Adults present with either curves that have been missed or not treated as adolescents or as degenerative curves. Surgical treatment usually combines correction and straightening of the curvature and deformity with implanted rods and fusion of the involved vertebrae. The fusion for pain management is more important for adults. This means that the levels fused act as one column of bone. Operations for scoliosis can be carried out from the front (anterior) or the back (posterior). The aim of the surgery is to stabilise the spine in a good balance, both sagitally and coronally and reduce pain. What is Vertebroplasty & Kyphoplasty? Vertebroplasty and kyphoplasty are minimally invasive procedures for vertebral compression fractures (VCF), which are fractures in vertebra, the small bones that make up the spinal column. When a vertebra fractures, the usual rectangular shape of the bone becomes compressed and distorted, causing pain. These compression fractures, which may involve the collapse of one or more vertebrae in the spine, are a common symptom and result of osteoporosis. Osteoporosis is a disease that results in a loss of normal bone density, mass and strength, leading to a condition in which bones are increasingly porous or full or small holes and vulnerable to breaking. Vertebrae can also become weakened by cancer. In vertebroplasty, physicians use image guidance to inject a special cement mixture through a hollow needle into the fractured bone. In kyphohplasty, a balloon is first inserted through the needle into the fractured bone to create a cavity or space to control where delivered cement goes, it may also restore some of the compressed height of the vertebra. Once the balloon is removed, the cement mixture is injected into the cavity where the balloon was. Vertebroplasty and kyphoplasty are used to treat pain caused by vertebral compression fractures in the spine. Typically, vertebroplasty is recommended after simpler treatment, such as bed rest, a back brace or pain medication, have been ineffective, or once medications have begun to cause other problems, such as stomach ulcers. Vertebroplasty can be performed immediately in patients who have severe pain requiring hospitalization or conditions that limit bed rest and medications. Kyphoplasty is performed on patients experiencing painful symptoms or spinal deformities due to vertebral compression fractures resulting from osteoporosis. The procedure should be completed within eight weeks of when the fracture occurs for the highest probability of restoring the spinal bone to its normal height. Chronic back pain may also benefit from exercises however these should be recommended only after full assessment by an appropriately qualified specialist who can arrange a programme appropriate to your needs. This may be performed on the day of your appointment. The xrays will be seen by Mrs Morgan and reported on after the appointment by a consultant radiologist. Xrays give information about the bones and joints, the curves of the spine and the heights of the discs. CT scanning gives a three dimensional view of soft tissues, blood vessels as well as bones. It uses x-ray radiation exposure. MRI scanning gives a high quality scan of all the tissues of the body. It involves the patient going into a non harmful magnetic field. This is in the form of a tunnel. As a result some patients may not be suitable to have MRI scans. If you have claustrophobia it is possible to have an MRI scan in an open scanner and Mrs Morgan can refer you for this. It is important that every patient completes the MRI safety questionnaire before they have a scan. A bone scan looks for abnormalities in the bones. It is also known as a radionuclide scan, or a scintogram. A bone scan can look at a particular joint or bone. The scan involves having an injection of a small amount of substance called a radionuclide the amounts are non- harmful. The scan uses a 'gamma camera'. This is a camera that picks up signals from the radionucliotide. The radionuclide travels through the blood and collects in your bones. More of it tends to collect in areas where there is a lot of activity in the bone. These areas of activity are picked out by the camera and give a picture of your skeleton. Blood tests are occasionally used in the diagnosis of spinal problems. Blood tests can show inflammation, infection and metabolic conditions which may be contributing to the symptoms. The types of blood tests requested will be discussed with the patient. Any, clinically significant, abnormal blood tests will be discussed with the patient and their GP will be notified. Injections can be used in cases where even with the MR scan or other diagnostic tests it is uncertain which area of the spine is causing the patient’s symptoms. Injections which change the patient’s symptoms can give useful diagnostic information about which level of the spine is causing the patient’s symptoms. Discography may be required to determine which vertebral discs are causing the symptoms. This is an investigation done under X-ray guidance. The procedure is done as a day case. A contrast medium is injected into the disc space and x-ray images are taken. The procedure can be uncomfortable and for this reason is normally done with some light sedation. It is only undertaken after full discussion with the patient when the decision has been made that the benefits of the information that it will yield out way the risks.